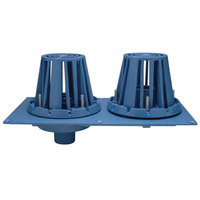 The Zurn RD2130 combination roof drain and overflow are constructed of a Dura-Coated cast iron body. Roof drain features a cast iron clamp device with an integral gravel guard, roof sump receiver, and cast iron dome strainer. Zurn Engineered Water Solutions® is a recognized leader in commercial, municipal, and industrial markets.